Hurst Show – 24 & 25/06/17 – another great weekend with good weather at our local regular event, and Search Dog Pepsi even celebrated her 10th birthday there, with a visit from Matt Allwright! We’ll be there again this June (23 & 24), so do come and say hello!? Thames Valley Police Open Day – 05/08/17 – a record-breaking crowd attended and we really enjoyed the day although we didn’t have the opportunity to do our normal demonstration in the main arena. We did have our photos taken with the helicopter to make up for it, and hope to attend again this year. Ascot Fire Station Open Day – 19/08/17 – our first time attending this event; there was an amazing turnout and we were happy to show people our new boat for our Water Search Dogs. Swallowfield Show – 27 & 28/08/17 – our first time at this event, too. The weather was so hot we had to abandon our display on the second day and stay in our marquee to shelter from the sun! Dogs Unite Berkshire – 08/10/17 – organised in Newbury by Guide Dogs for the Blind. Joint Asset Launch – 16/10/17 – held at Dorney Lake, we shared the limelight with our sister team BLSAR to showcase to our guests (from the emergency services, supporters, fundraising partners and the Vice Lord Lieutenant for Berkshire) our new boats and drones. The official naming ceremony took place for our boat “DB Alpha”, “in memory of Jan Leahy” (a long-time enthusiastic sponsor of our team). We also demonstrated how our dogs work in each of the 3 disciplines – airscenting, groundscenting and water search to a very enthusiastic response. Emergency Services Open Day – 26/10/17 – an annual event for us at Arborfield, sadly the weather wasn’t very good this year but that didn’t stop lots of families turning out to meet the dogs and see fire engines and other displays. 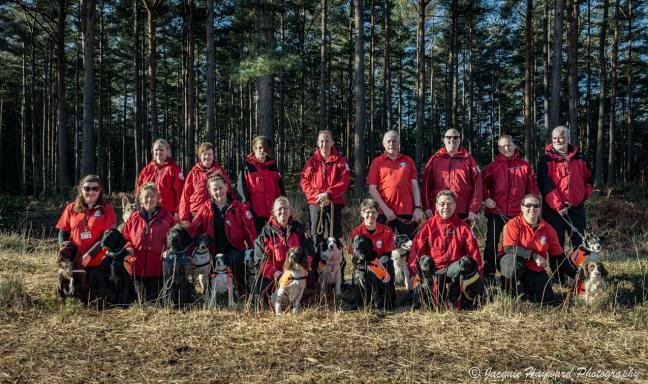 Lowland Rescue Search Dog Open Weekend – 11 & 12/11/17 - we hosted this at Buttersteep near Bracknell and welcomed several people from 6 teams all around the country who want to learn how to train their own dogs. It was very well-received by all those who attended. Christmas Jumper Dog Walk – 16/12/17 – suggested by one of our long-term supporters, this was purely a friendly and festive get-together which raised some much-needed funds towards our running expenses. Thanks to Charlotte for organising it! Photoshoot for new Team Photo – 17/02/18 – thanks to Runnymede Photography Society for attending our training session at Buttersteep, and taking numerous posed and action photos of the Team, as well as individual dogs and handlers, to update our profile. We really love the photos! Crufts – March 2018 – Trainee Search Dogs Vesper and Bert attended with their handlers Jon and Simon to give media interviews regarding the People’s Postcode Lottery Dream Fund, which has donated £1million to Lowland Rescue and Missing People in their Search Dog Heroes initiative, towards training search dogs across the UK. February – Search Dog Gus and handler Jann passed their Level 2 Airscent assessment. Gus is Jann’s second qualified dog as she already has Search Dog Finnley (Level 2 Airscent), making her the second person in the team with 2 currently-qualified dogs. 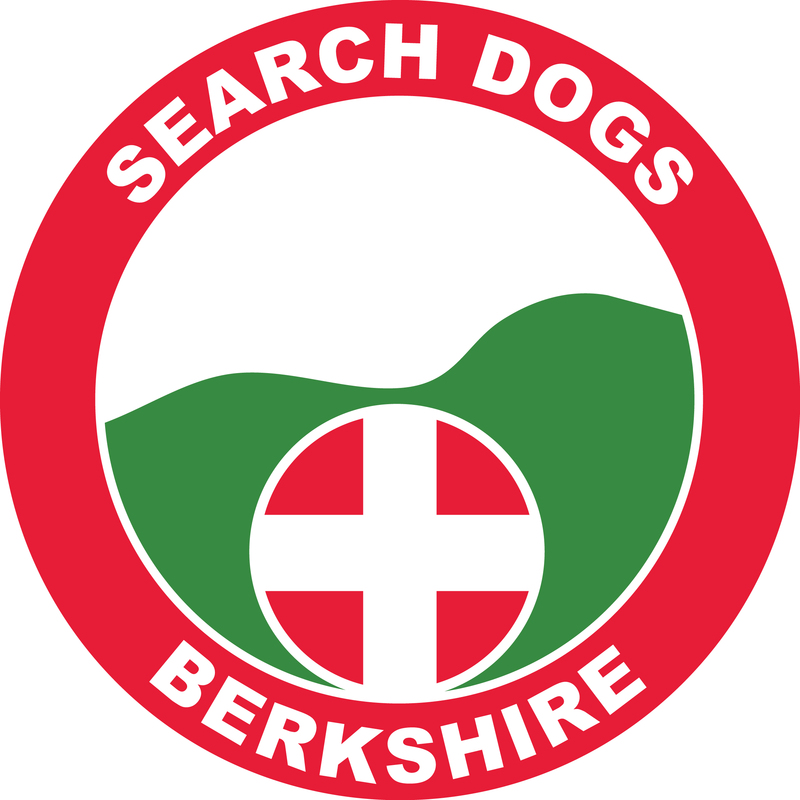 February – Search Dog Isla (Level 2 Airscent) and handler Jon requalified after a period of being a non-operational team following the expiry of their previous qualification. Maintaining the required standard to pass assessment is very important and it is necessary to be re-assessed every 2 years. March – Search Dog Blaze and handler Sara passed their Level 2 Airscent assessment. Sara is the Team Secretary and works hard to keep us all in order! March – Search Dog Risk (Level 3 Airscent) and handler Lou requalified for the first time. Lou is the other handler with 2 currently-qualified dogs as she also has Search Dog Chip (Level 3 Airscent). April – new recruits, Probationers Peter and Sam, passed their Search Technician qualification on the way towards becoming Full Members soon. Lots of other ongoing training and ‘CPD’ has also been taking place, including First Aid, Navigation, Search Techniques and Communications, as well as the normal regular training sessions for all the trainee and qualified dogs, throughout the period covered by this update. November – Search Dog Brock (Level 3 Airscent) was almost 16 and was the first qualified Lowland Rescue Search Dog in the UK. He had the first ‘find’ for a LR dog and was involved in around 250 searches, as well as the trials for the first cancer-detecting dogs; he did lots of photo shoots for various books and magazines, taught children about search dogs and even won ‘Friends for Life’ at Crufts. Brock was an utter gentleman, the kindest and gentlest dog anyone could ever wish for and will be missed by all who knew him. December – Search Dog Ahsoka (Level 2 Airscent) fought a valiant battle against a ridiculously aggressive cancer. Even on three legs she battled on and continued with search training and living life but, in the end, had to concede. She left a huge void in the lives of her family. Members - we also said 'goodbye' to Clare, Dave and Sarah who had all been Operational Members of the Team for a while but have now moved on to pastures new for various reasons.